What do YOU think of when you see/hear the word beetle? Do you think eyeeuuuwwwww, "nasty bug" or "stinky bug" or (God forbid )" a cockroach"? Or do you think of "The Mummy" series of movies where the beetles are swarming all over the bad guys. yuck! 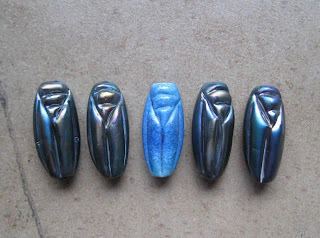 Now what comes to mind when you see/hear the word "Scarab" ? All things Egyptian?, King Tut?, Nefertiti? Amun -the sun god? Golden icons? Royalty, mystery, other-worldly? Talismans? As Shakespeare said -"whats in a name ?" A lot , apparently. Enter the scene - one beautiful , raku colour, glazed ceramic Scarab bead, created by the very talented Sue Kennedy of SueBeads. 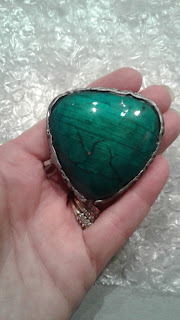 I was fortunate enough to be gifted with one of these lovelies as part of the monthly challenge with the proviso that I make piece of jewellery and blog about it. **WARNING** this a really long, wordy post, so feel free to just scroll through the photos, if you're pressed for time. Here it is ready to be linked into my necklace, connector loop on one end, e-bead on the other. Now when faced with a challenge such as this, one hopes to do the gift justice. To make it the FOCUS of the final piece. What if I mess up? What if no one likes it? What if my muse deserts me midstream? I happen to be a lover of all things Egyptian. Have been since I saw the King Tutankhamen exhibit at the Ontario Museum of Art in Toronto Ontario many many years ago. ( so many I truly don't remember what year that was.) I love the Art Deco period for it's rich symbolism, clean-lined designs and it's connection to the discovery of the tomb of King Tut. I made a piece with polymer clay a few years back when I worked at a bead store, just messing around with a new- to me -product and made this incredibly boring tan/beige pendant thing. Yet again I forgot to take a picture of it before I added colour to it. It really was too ugly to take a photo of , that's my excuse. It's amazing how paint can transform ugly to pretty. imo. this is upside down I think I was hoping to make a lotus leaf. two holes for attaching to something. In case you wonder what goes through a designers mind or the process we use, here is a shot of my work table / bead tray with a selection of potential partners for my scarab bead. Lots of shiny bits to choose from. When working on a design, in the back of my mind I am thinking about the rest of the necklace (or bracelet) and I was playing around with various options for chain or beaded components. I will often set up several variations of bead combos to see which one best suits the design. Using thin wire keeps them together while I mull things over. I was hoping to incorporate another hand-made bead by painting it with the same colours as the polymer clay piece. I love the finished bead but in the end, when editing, I had to remove it. It overpowered the scarab bead. Here is the final piece. I decided not to create a fully beaded rope/chain necklace but to make several small beaded links connecxted with lengths of antique copper chain. I am quite pleased with it & by using chain for most of the necklace, I can choose at a later date to add the horizontal bead back in. I'm still undecided at this point. I had fun making this one and I think it will become my personal talisman necklace. Thank you for sticking with me till the end of this novel. To see what the other designers made just click on one of the links below. Love your added component that really compliments the scarab bead. I too am a lover of Ancient Egypt, such and interesting culture. I love it Deb! Very Egyptian! I love your polymer pendant! Thank you so much for showing your process, and playing along! Deb, those two elements go together so well! It is a great necklace. Beautiful design... Those elements were made for each other! I love it. It's very reminiscent of Egyptian revival-style jewelry...which I happen to collect. Great job! You make me want to be a flapper and wear this. How fortuitous to have that lovely lotus(?) component. It looks amazing with the scarab. I also love how you pulled everything together in the necklace. Thanks for participating in the design challenge this month and for reading Art Elements! Love your necklace Deb - it has a great flow and the components work so well together. Beautiful! Thank you for playing along with us this month! Hello - Sorry I am late... I love this - serendipity. It was simply meant to be. We all have treasures in our stash that we save for the right moment... and it was now! Thanks for joining us! Thanks for stopping by . Nice comments are food for the soul. Last month I was lucky enough to be selected to receive a hand made RUNE as part of the Art Elements Monthly Challenge. Niky Sayers is the talented artist who made this array of Viking Runes in copper clay. The Rune I received is titled SOWELU, meaning Wholeness, Life Force, or The Sun's Energy. This is the Rune Niky sent to me. It didn't have any holes in it, as she left it up to me if and where I wanted to put any holes. Based on it's size -5/8 inch x 3/4 inch (14 x 21 mm)- I decided to use it in a bracelet. I decided on 4 holes for best visual and physical balance. I got time to play along this month . I somehow seem to miss the deadline for participation , so hopefully I can play along this month. Here is the inspiration photo that I used for my starting point. Aren't these outfits stunning? love the colours! I have always been a fan of the plums, purples and garnets. well today is THE day. It's reveal time for the 2017 bead peeps swap n hop event. Organized by our hostess Linda Anderson of Cherry on Top Design Co. http://fromTheBeadBoard.blogspot.com its a fun way to meet new beady peeps and to challenge ourselves by relying on someone else's bead picks for us. This is the first time I have participated in this swap . *warning Long read ahead * just scroll through the pix if you don't want to read it all. My partner is a polymer clay artist, Nicole Rennell from Massachusetts, USA. She sent me an amazing example of her latest works -Faux Labradorite, plus an assortment of beady goodies to accent and enhance my design. just check them out. I live in a small hamlet on the Rideau Canal, with my hubby of 45+ years. Our kids are grown and gone so we are on our own here in this idyllic setting. We are so lucky to have found this place.